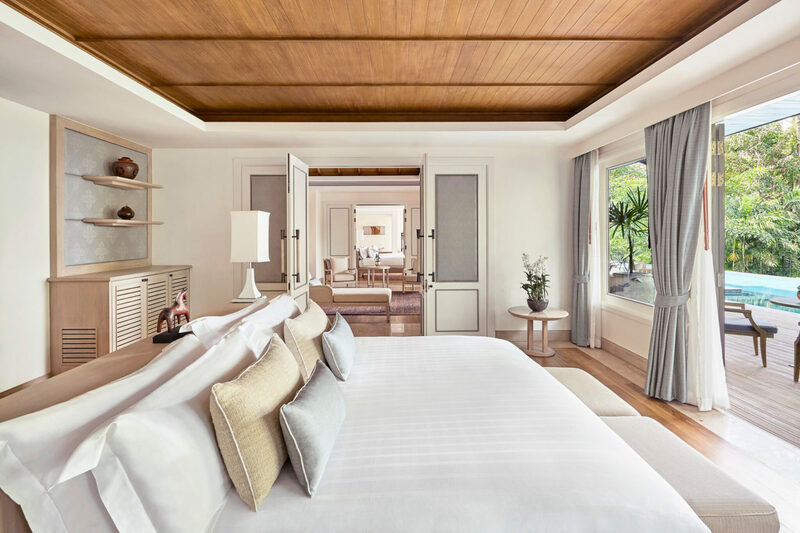 In Sanskrit, Trisara means “The Garden in the Third Heaven.” Sun-kissed and secluded, Trisara lives up to its namesake as a palm-filled resort paradise in northwestern Phuket, Thailand. Guests are easily at home in this seaside community offering suites, pool villas and residences with water views from the resort’s terraced hillsides. Thailand’s rich heritage exudes from every corner, whether it’s the sincere and gracious service or the treatments at Jara Spa for adults and children, rooted in centuries-old healing practices. Come evening, dining tables are rich with the bounty of the Andaman Sea and local farms, from freshly picked greens to translucent-skinned tuna at PRU, which was recently awarded One Michelin Star and Seafood at Trisara restaurant receiving the Michelin Plate designation. Residences come with a private chef who will create a lively family feast or an intimate dinner under the stars. An immersive culinary journey by private yacht leads travelers on a foraging trip to visit Phuketian “Mamas” in heritage homes and discover their authentic Thai recipes. 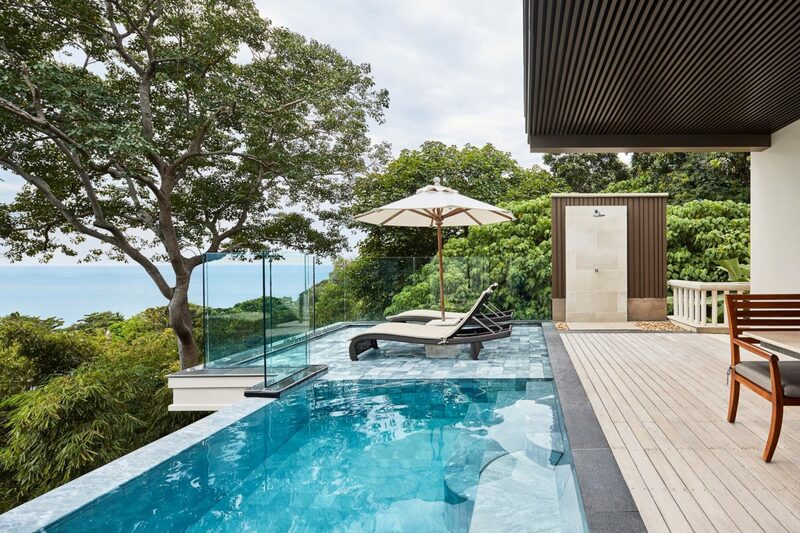 A place to rejuvenate, a place to roam, days at Trisara range from lounging around one’s private infinity pool to setting out on a helicopter flight over World Heritage-listed Phang Nga Bay. All Villas and residences sit on terraced, tropical hillsides and overlook Trisara’s private beach and the turquoise waters of the Andaman Sea. Crafted from beautiful lime-washed teak wood and decorated with Thai silks, the ambiance is unmistakably Thai, elegant and timeless. The 1,450 square foot Ocean View Pool Junior Suites are situated on the highest level of the resort, offering cool breezes, total privacy and panoramic ocean views overlooking Trisara’s bay. They have a private entrance walkway leading to the 750 square foot outdoor deck featuring a four-meter infinity plunge pool, extended by a three-meter reflection pool for sun lounging, and an outdoor shower. The 2,470 square foot Signature Ocean View Pool Suites are situated on the highest level of Trisara, affording guests canopy views of the resort’s manicured jungle and ocean as well as total privacy and modern, rich interiors. The suites are designed with an oversized king bed in the main bedroom with its ensuite bathroom, which opens via a sliding door to the living room. The living space has its own dining area and sofas that allow for conversion to a double bed, plus an outdoor shower and toilet. The expansive deck features a nine-meter infinity pool with panoramic ocean views and wonderful tropical breezes. 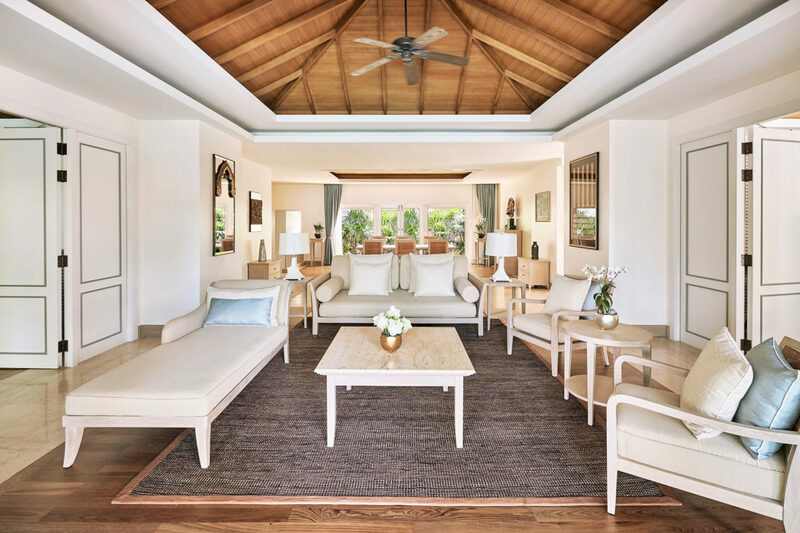 These one-bedroom villas occupy a total area of 2,580 square feet, including an air-conditioned bedroom over 1,000 square feet bedroom with bright, garden-facing bathrooms, a 10-meter ocean-facing private infinity pool, teak dining and sunning decks, and outdoor private shower. 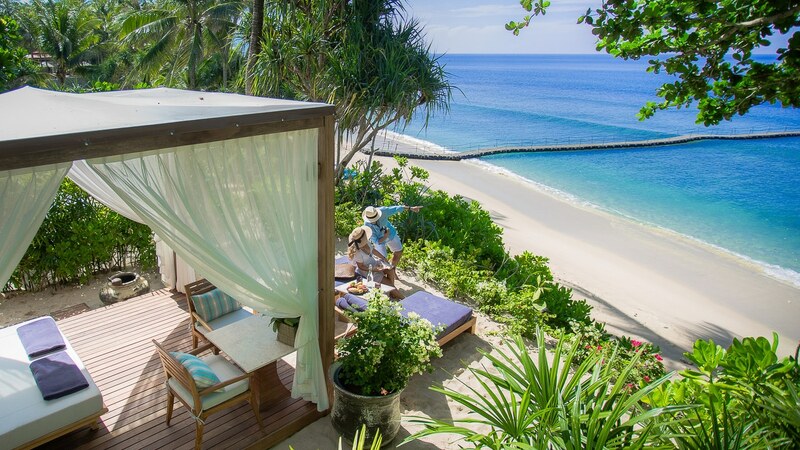 Our most-requested accommodation – the Ocean Front Pool Villas sit 25 feet above the beach and bay, offering absolute privacy and panoramic sea views. These one bedroom villas occupy a total area of 2,580 square feet, inclusive of the 96-square-meter air-conditioned bedroom and bright garden-facing bathrooms, a 10- meter ocean-facing private infinity pool, teak dining and sunning decks, and outdoor private shower. All pool villas offer a true sense of privacy, beautiful ocean views and are an easy stroll down to the hotel main facilities. Pendant clusters of crimson berries and old growth bamboo line the wooded pathways leading to this great escape, where families and friends gather. The 3,220 square foot 2-Bedroom Ocean Front Pool Villas sit 25 feet above the bay with absolute ocean-frontage and spectacular views. 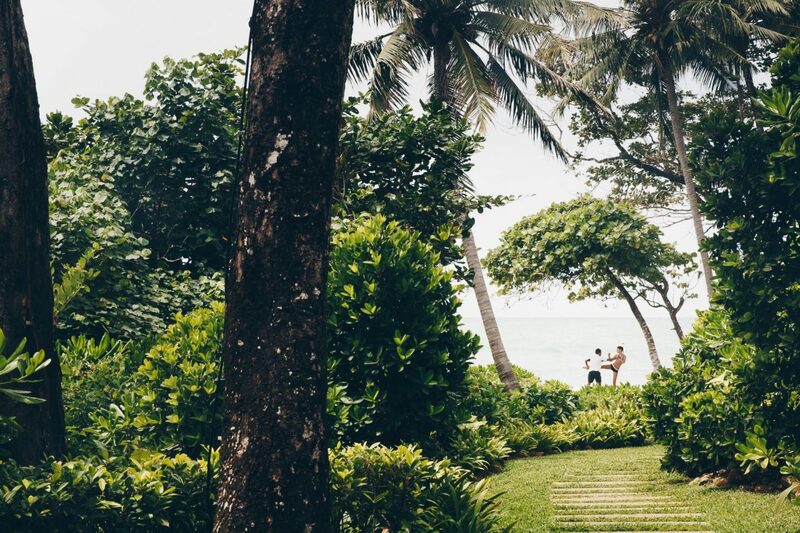 Lush tropical gardens surround the residences which open over the pool to the sea view. On either side of a central living and dining pavilion sits the 2 main bedrooms, which also have private access to the pool and decks outside. The large 18-meter private infinity pool and open teak decks house outdoor living and dining furniture. The villa is equipped with the full kitchen and the services of a dedicated cook and housekeeper. A range of magnificent three- to seven-bedroom villas sit directly above the bay over Trisara’s headlands and embrace the ocean and gardens. All villas are cared for and serviced by one dedicated cook and two housekeeping staff who prepare home-cooked Thai and Western dishes from the modern kitchen. With unique features such as a Martini bar, ocean-facing living spaces and beautifully manicured gardens and expansive pool decks, the residential villas are the perfect setting for wish granting events and celebrations. 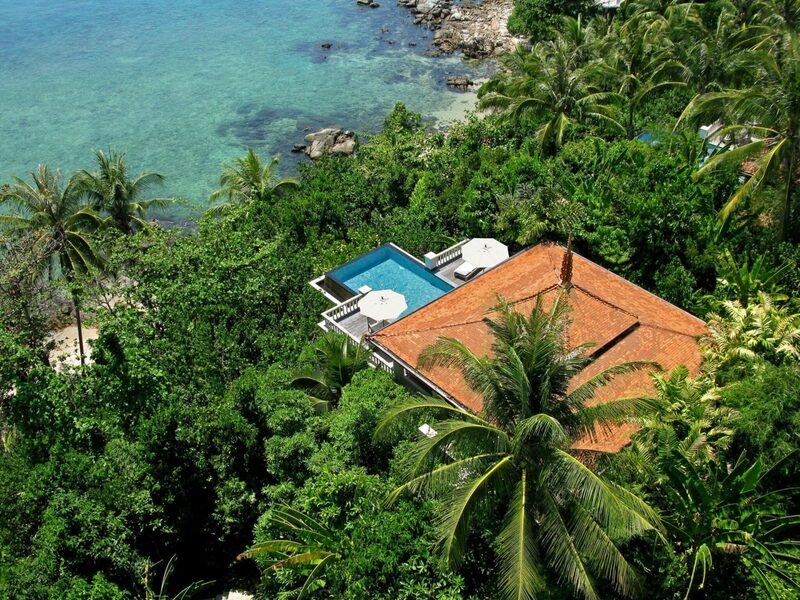 Trisara is located on Phuket Island’s natural northwestern coastline.